New oceanfront home on the popular North Shore. Perfect for snowbirds, AARP members, retired people, Canadians, Europeans, or just anyone who can escape for a lengthier time period. 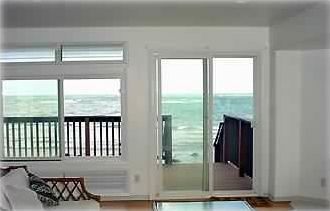 Enjoy the breathtaking oceanview from the living room. Lay out on a six-foot bay window and take in the majestic Koolau Mountains and the Pacific Ocean in one sweeping view. Sunbathe on your own private deck with steps leading to the ocean. Create your own meal in an open kitchen fully-equipped with all the essentials including a spectacular oceanview. Sleep to the soothing sound of the rhythmic ocean. Imagine waking up to the magnificent sunrise every morning. It's all right here at our Hawaiian paradise! Experience a truly authentic vacation by venturing into the nearby towns: the unforgettable Polynesian Cultural Center (5 minutes away), the historic Haleiwa town known for it's 'shave ice,' delicious Kua Aina Burgers, surf shops, jet-skiing, and art galleries (30 minutes away), or take the scenic drive to the famous Surf spots - 'Bonzai Pipeline,' Sunset Beach, or Waimea Bay (15 to 30 minutes away). If you hunger for the nightlife, a 40 minute drive will have you in Waikiki, where you can dance or dine. Or just relax at our secluded and cozy home away from the congestion of the city. Enjoy the wildlife right from the sun deck. Be visited by the Hawaiian Monk Seals, Hawaiian Green Sea Turtles, or Humpback Whales (from December to mid-May, peak season January and February). No matter what you choose, it will all be memorable at our Hale O Kalahiki, the House of the Rising Sun. Granite counter top, full size bathtub. Window looks out to the ocean. Troy and Janice were very helpful before our vacation supplying us with lots of information about activities, restaurants, etc. They were there to meet us the night we arrived and made us feel very welcome. They gave us the traditional leis welcome and a beautiful gift basket full of goodies. They went out of their way to ensure that we were comfortable. This lovely house was spotlessly clean and well equipped. We watched beautiful sunrises every morning from the deck so close to the ocean. We watched equally beautiful moonrises several nights as well. During the day, we drove to absolutely beautiful beaches and enjoyed watching surfers tackling some of the biggest waves we've ever seen. We enjoyed being 'in the country' and made sure to visit some really neat places to eat. Papa Ole's in the nearby shopping center had great food and was obviously a favorite of the locals. Giovanni's Shrimp Truck, just a few miles north, was fantastic! This was a very relaxing and beautiful vacation. We hated going home. If we ever travel to Hawaii again, we want to come back to the House of the Rising Sun. Thank you Troy and Janice for sharing your lovely home. We have had the most amazing time, From meeting you both, enjoying all the delicious treats that you left for us in the gift basket, to hearing the ocean....Hale O'Kalahiki is truly a "little slice of heaven"
We had everything we could have wanted or needed! Thank you so much for sharing your Island retreat with us and for making this a very memorable vacation. We hope to come back! Would not hesitate to go back again and again. Troy and Janice have a real gift for both hosting and helping you feel comfortable. From the moment we stepped into the house and were welcomed by Troy and Janice with leis, we knew this was Oahu's North Shore at its best! The house was beautiful and the location right on the beach front was fabulous and House of the Rising Sun was indeed blessed with a direct view of the rising sun. It was spotlessly clean, linens and furnishings were perfect, fully equipment kitchen and even binoculars and beach equipment available to use. We wouldn't hesitate in recommending this property for your vacation - it was so hard to leave it behind. Lastly, before they left us to it, Janice spent as long as we needed to highlight tourist information and tips that really made a difference to our stay. My first trip to Hawaii and I didn't want to stay in Honolulu with all the crowds. I wanted relaxing, ocean front, a clean beautiful place to stay. I researched and researched and decided upon the House of the Rising Sun. From my first contact with Janice I knew this was the spot for my husband and I to spend our vacation. You will not be disappointed!! So relaxing and the view from the deck is amazing! Troy and Janice show the true Aloha Spirit!! MONTHLY RATE IS DISCOUNTED at $175.00/night. NO DISCOUNTS. Rates are FIRM and are based upon double occupancy. Peak Season rates will apply for December 1st thru January 31st at $250.00/night for 30 days, NO DISCOUNTS. Departure cleaning fee and taxes NOT INCLUDED in rate. NO CHECKS IN on Thanksgiving, Christmas Eve/Day or New Year's Eve/Day.